With a career barely six months old 18-year old Nial Ainca makes a statement fopr herself on her second single Lit, produced by Amvis Instruments. 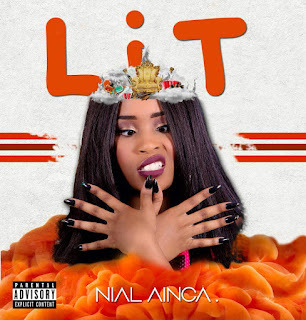 With a career barely six months old 18-year old Nial Ainca makes a statement for herself on her second single Lit, produced by Amvis Instruments. Lit continues where her debut single I'm Gunnin' left off. This time she has no inhibitions as she is too lit to not be confident. There's a certain aggression one would only find from male rappers. The last femcee I heard with such aggression was Alvina (who seems to have a taken a musical hiatus). She could very well become the Harley Quinn of Zim Hip-Hop if she maintains this aggression. I';m glued and I will definitely be on the look out for what else she will drop next. Visuals, hopefully. Currently working on her yet-to-be-titled EP Nial shows no sign of backing down and may just be a contender for the best newcomer come next year. This is definitely one artist to watch out for in 2018.